I believe the plates in this series were manufactured by McCoy. It is dated 1972 and marked American Greetings USA. It measures 10 1/2 inches. There are no chips, cracks, breaks or loss of paint. 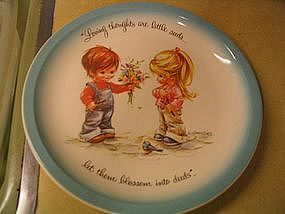 It says "Loving thoughts are little seeds, let them blossom into deeds." If you have any questions regarding this item, please email. I need your zip code to calculate the postage.